Issue: Does a racially segregated University of Maryland Law School violate the Equal Protection Clause of the Fourteenth Amendment? Summary: Donald Gaines Murray petitions for a Writ of Mandamus to order his acceptance into the segregated University of Maryland School of Law. 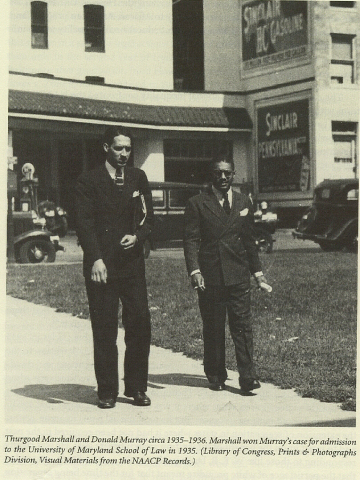 On the grounds that Murray was denied access to an accredited local law school, Murray lawyer Thurgood Marshall pleas that he was denied "separate but equal" treatment. On appeal, Judge Bond rules that, in order to accommodate Plessy v. Ferguson, Murray may attend the institution, but must be separated from white students. Marshall, who sought to undermine segregation on the level on higher education, later argues that separate but equal is impossible in Brown v. Topeka Board of Education, a more frontal attack on segregation.